This holiday season I hope that someone on your list will be receiving a custom, handmade Memory Quilt! 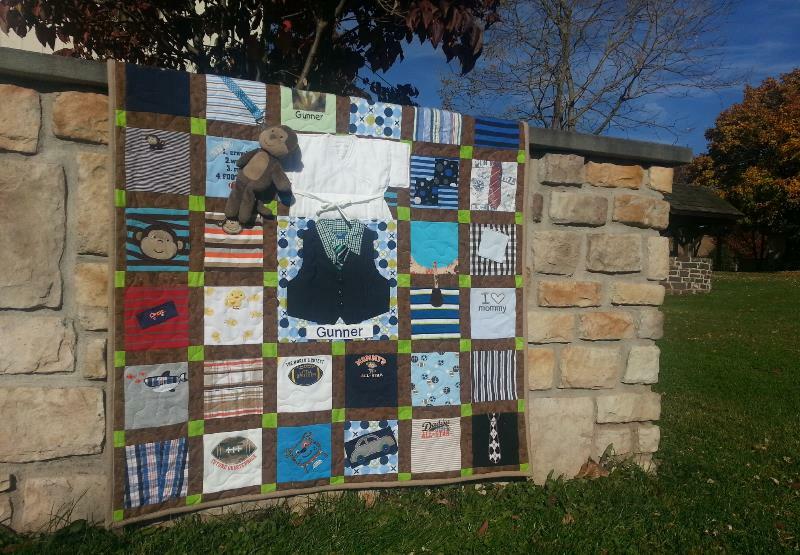 For those lucky enough to be giving or receiving a Memory Quilt it is my wish that each and every quilt brings warmth, fond memories, and a feeling of home! 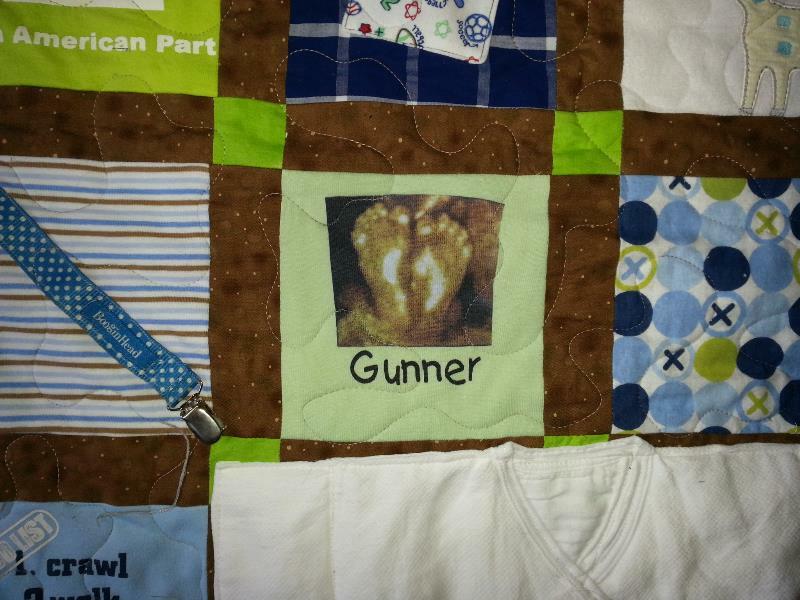 Many people have contacted me within the past four weeks requesting a custom Memory Quilt. Sadly, I have not been able to make their quilts in time for Christmas. Please remember that these quilts take a long time to make! 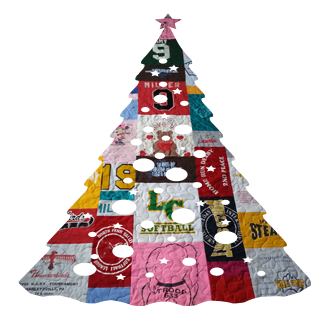 Holiday quilts need to be ordered in August or September. Exciting news here at Memory Quilts by Molly: a new product is being introduced! 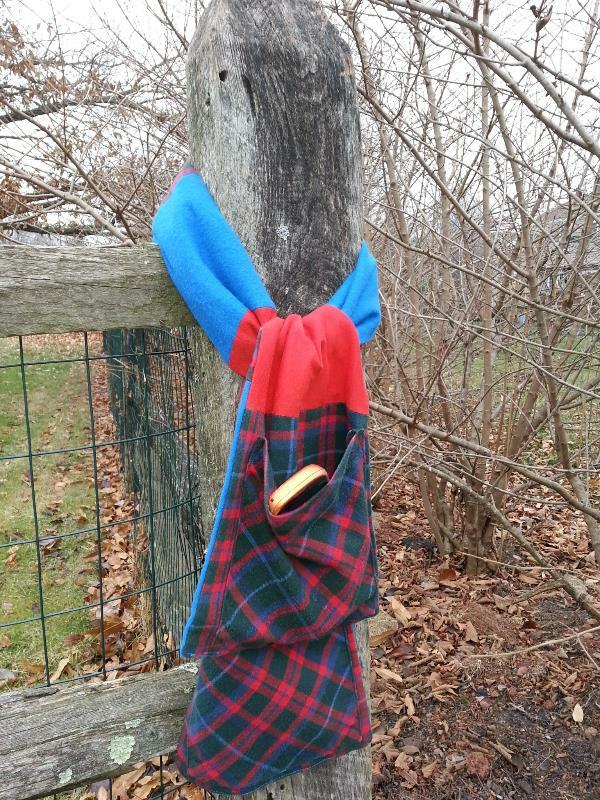 A custom, handmade Memory Scarf made with your t-shirts. 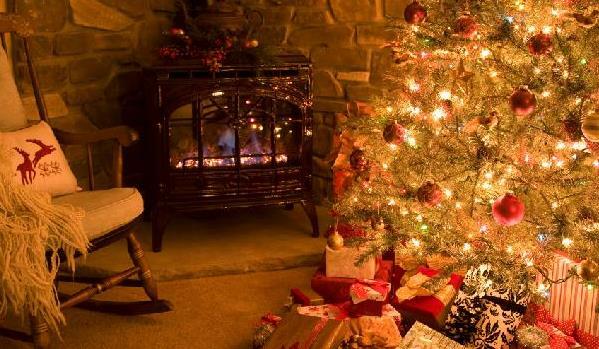 It will keep you warm, in style, and wrapped in sweet memories! Read on for more details. The child's name was embroidered to make it extra special! 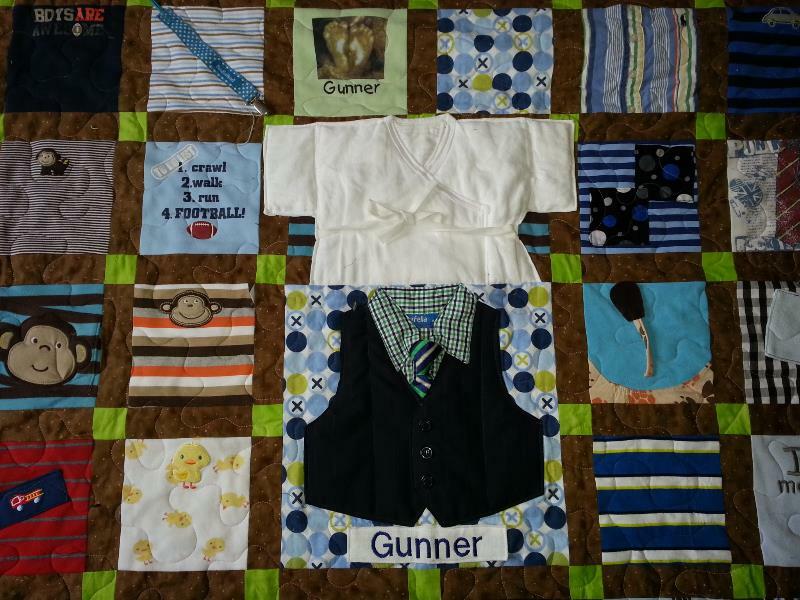 This quilt really does tell the story of baby Gunner's first year! Yes, you can warm up with these amazingly soft scarves that are made out of super soft knit t-shirts and are sure to keep you in style all year round! 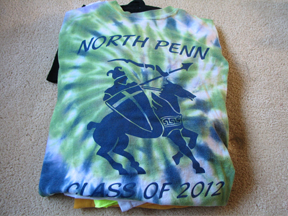 They are custom made with your t-shirts. Another beautiful way to wrap yourself in sweet memories! 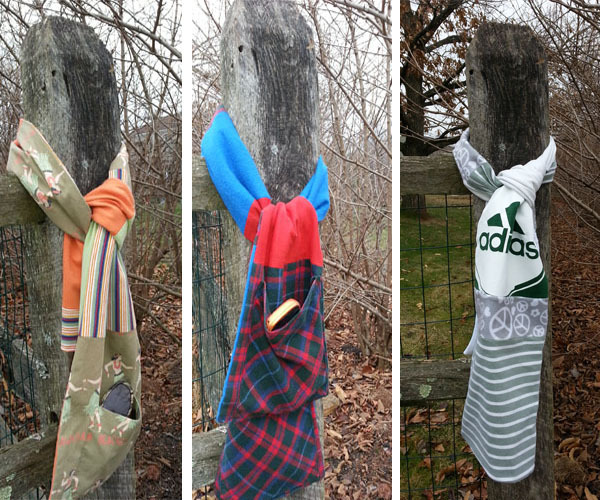 Each scarf measures 9" by 60" and comes with a pocket-perfect for your phone! 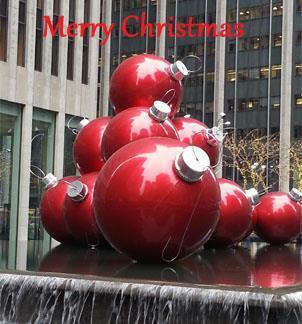 Priced at $50.00 these are sure to please every budget and look perfect any time of year! 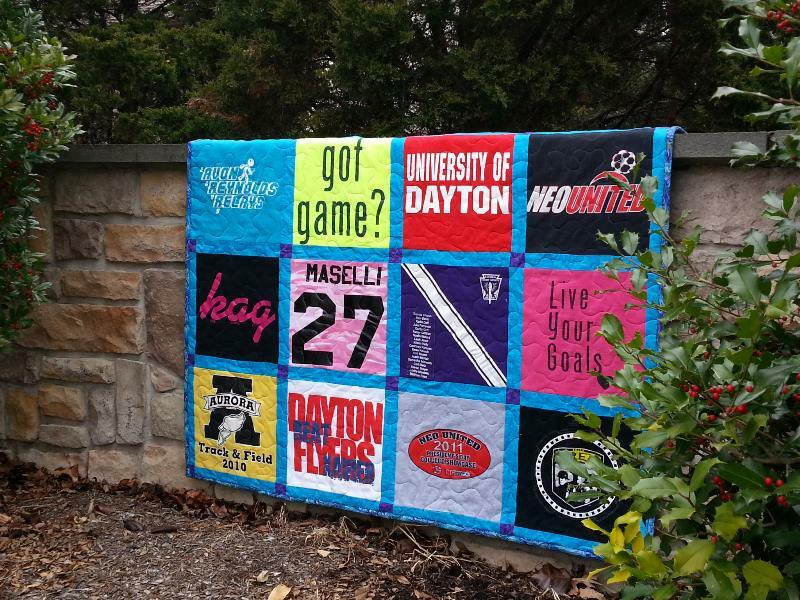 Once a year, Memory Quits by Molly donates a Memory Quilt to a worthy charity. 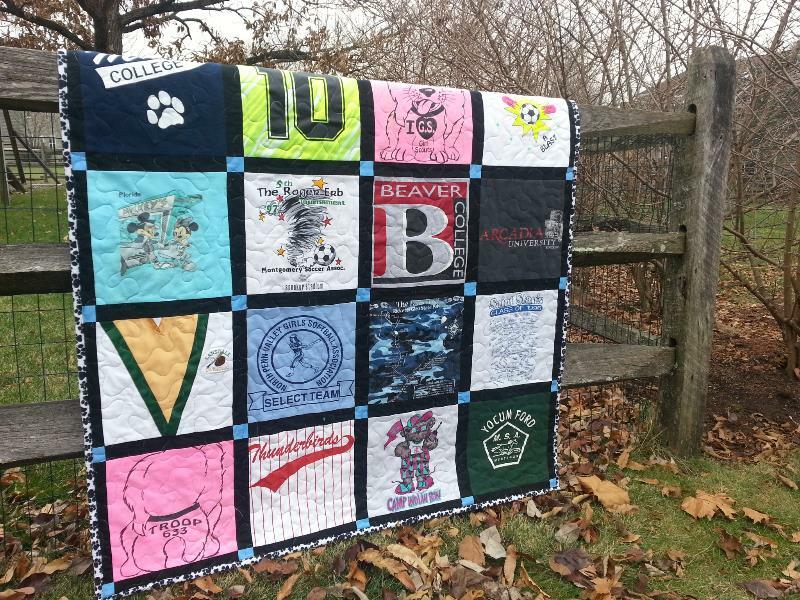 Last year, a FREE Memory Quilt went to Bloomsburg University Greek Alumni Association. This year, I am pleased to announce that Alex 's Lemonade Stand Foundation is the WINNER of a lap quilt in the style of their choosing! This quilt will be presented at the Lemon Ball! Stay tuned for pictures. 19 Christmas Quilts were made this year. What a wonderful feeling it is to know that so many of my Memory Quilts will be shared this holiday season! Below are some that I have made, the others are top secret! I wouldn't want to spoil the surprise! A large lap quilt made in the traditional style with block sashing! A regular size lap quilt made with high school tees! 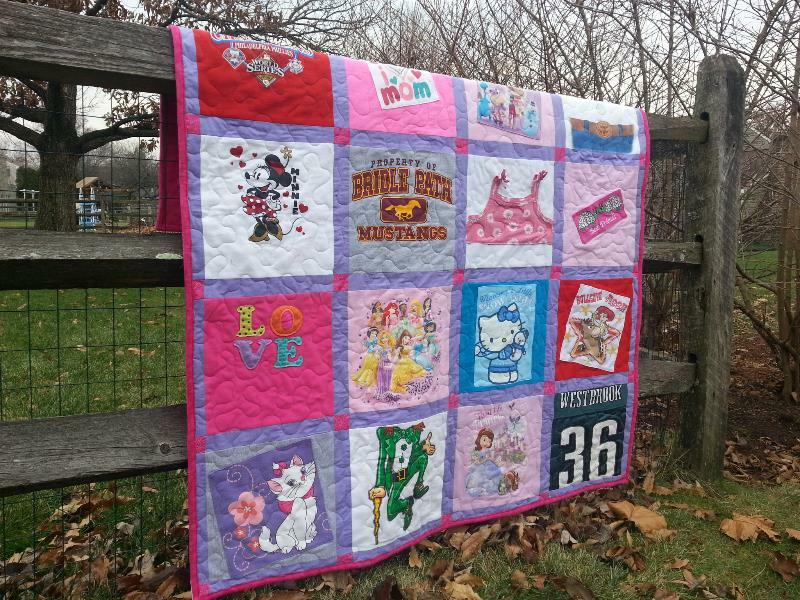 A large lap quilt made with sweet childhood tees! This will always be one of my favorite quilts. Sheila loved all things Christmas. From New York, to Japan, to the Philippines, to South Africa, to Argentina, to Lansdale, and everywhere in between, may each and every one of you have a joyous Christmas and Happy New Year wrapped in your one-of-a-kind Memory Quilt!